THEN CONSTRUCTION BETTER BE HAPPENING! The construction company works on the roads at night. AT NIGHT! Yet, they conveniently leave all their cones up during the day, leaving the major vein between the suburbs and the business hub town where many of us work barely usable. Other roads leading to the same city might be used, but they take just as long, because you're going all the way around and coming up the other end. In sort, I am screwed when it comes to my commute. Now, a logical person would think that IF NO CONSTRUCTION IS OCCURRING, THEN SAID CONSTRUCTION CONES MIGHT GET MOVED TO THE SIDE WHEN NOT NECESSARY! However, I guess that's too much of an inconvenience. I don't think I'd mind being slowed down so much if I actually saw people out there, you know, working. Doing road construction. But NOOOOO. No, they just leave their crappy cones up to piss the rest of us off. Then I get a tweet from Oraia the Sphinx - of the podcast Media Astra ac Terra - about a 9 day long traffic jam that spans 60 miles in Beijing. I suppose it should make me feel less pissed, what with the whole 'it could be worse' mentality, but it doesn't. Share YOUR traffic/commuting woes with a comment! It took me 6 hours! SIX! Because a lorry broke down and caught on fire. It was horrendous. I was so hot and I ran out of water and all sorts. I am lucky in being able to walk to work but there was sewer replacement going on at a major crossroads and on the one side was the sign 'Pedestrians use other sidewalk', so I crossed to the side the arrow was pointing to be met with another sign saying 'Pedestrians use other sidewalk' pointing back the way I came. I looked at the worker in front of me and pointed to both and held up my hands to say - so what now? He looked, scratched his head and shrugged his shoulders. I walked down the middle of the road between the workers. 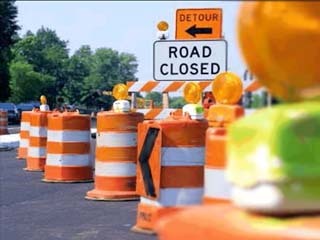 I think Michigan is the only state that has the same construction going on the same highway for 6 years! I would travel this two to three times a month in early 2000. I just went that way again for the first time in years and they are still working on the same stretch of highway only thing is this time there was no one working!